In markets where regulatory oversight is constantly evolving, complacency is not an option. siena's compliance record starts from the first engagement with clients via the treasury or sales desk to ensure comprehensive data capture (including voice and email capture where applicable), order and trading controls and best execution adherence. 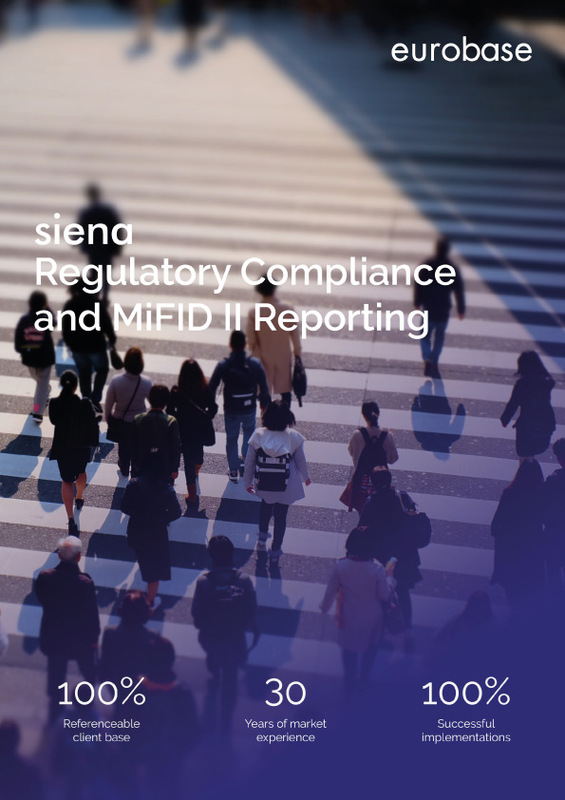 siena meets all client engagement requirements with full audit trails, trade reconstruction and reporting in a single, compact application, and safeguards trading rooms and sales desks adherence to MiFID/MiFIR, EMIR, SFTR, PSD2, Global Code and other regulatory regimes. siena is a real-time MiFIR reporting solution. - For Best Execution siena records full quote history and all costs & charges incurred on a deal triggering alerts when a client attempts to trade on prices that are beyond the agreed ranges. Compliance begins with the first conversation through to deal execution, whilst also recording all interactions for quotes, even those that may be rejected by you or your customer. All actions are UTC timestamped and associated with a specific user; peer to peer and direct chat can also be captured. - siena provides trade and order monitoring and highly flexible controls that can be applied including counterparty, trading group, amount bands, channel and/or time zone to trigger real-time alerts such as limit violations. - Mid-rate reference prices and volatilities are recorded for all deals and orders across all instrument classes based on the user-definable mid-rate reference price source. - siena’s ready-to-deploy adaptors provide connections to major ARM’s and APA’s for trade and transaction reporting. - There is no need to replace your current treasury and trading systems; you decide if you would like to deploy siena to drive the order workflow, or plug in to your current dealing solution. siena is fully configurable to adapt to your workflows. MiFID II applies to financial services businesses trading certain products anywhere in the EU as well as those providing services cross-border. This includes investment firms, trading venues, data reporting service providers and third-country firms providing investment services or performing investment activities into the EU. Under EMIR, EEA institutions must report all derivative transactions to an approved trade repository. In addition, firms trading certain over-the-counter (OTC) derivatives must also post and report variation margin. - siena’s ready-to-deploy adaptors provide connections to major Trade Repositories and CCP’s for trade and transaction reporting. The European Commission is increasing the transparency of the securities financing transactions markets, which are not currently covered through other regulations. Although the date has not been set, this regulation is likely to come into effect in Q3 2019. Securities Financing Transactions (SFTs), represent any transaction where securities are used to borrow cash, or vice versa. This includes repurchase agreements (repos), securities lending activities, and sell/buy-back transactions. In each of these, ownership of the securities temporarily changes in return for cash. SFTR will require both financial and non-financial market participants to report details of their SFTs to an approved EU trade repository in a similar way to EMIR. These details will include the relevant terms of the repo, stock or margin loan, the composition of the collateral, whether the collateral is available for reuse or has been reused, the substitution of collateral at the end of the day and the haircuts applied. The SFTR reporting requirement is dual-sided and requires the provision of a Unique Transaction Identifier (UTI) for each trade and a Legal Entity Identifier (LEI) for their counterparts in the trade. EMIR requires data in 129 fields from three categories to be collected; counterparty data, collateral data and common data. SFTR requires data in 153 fields across four categories; margin data, transaction data, re-use data and of course, counterparty data. The proposed regulation would cover SFT’s conducted by any firms established in the EU, regardless of where the individual branch is. It would also include those SFT’s conducted by EU branches of non-EU firms, and any SFT where the securities used are issued by an EU issuer or by an EU branch of a firm. siena provides accurate, real-time balances and projections that allows intra-day liquidity to be managed with far greater certainty. siena offers a wide range of rate source connectivity as well as a choice of rate types for lower value payments. For higher value payments this is supplemented by streaming prices with sales desk support. PSD2 facilitates the use of virtual accounts which, in turn, can be used to determine regional cash positions. siena supports any intra-company model ensuring that surplus cash can be reallocated to provide a more efficient use of funds. Analysing customer activity across multiple account providers gives valuable insight and helps spot trends over time. siena utilises adaptors to aggregate balance and payment information for full in-depth analysis. As well as consumers, this affects companies that are authorised by a European regulator as either an Account Information Services Provider (AISP), Payment Initiation Services Provider (PISP) or Account Servicing Payment Service Provider (ASPSP). Article 7 of GDPR obligates banks to obtain, document and prove the explicit consent from the data subject if they want to process data. siena supports the GDPR ‘right to be forgotten’, reconfirmation of client T’s & C’s and auto-lapsing of user access. Banks can choose to anonymise personal data of an individual with the aim of irreversibly preventing the identification of the individual to whom it relates. siena encrypts data both within the database as well as on export preventing identification of customer information whether by inference or linkability. Article 17 requires the deletion of data if it is no longer used for the purpose for which it was originally collected, or if the consent for the storage of data is withdrawn. siena’s data archiving is highly customisable and is easily controlled by appropriately permissioned end users. GDPR applies to all businesses and organisations established in the EU, regardless of whether the data processing takes place in the EU or not. Even non-EU established organisations are subject to GDPR. If a business offers goods and/or services to citizens in the EU, then it will be subject to GDPR. Compliance alerts, benchmarking of rates and prices, latency reporting, UTC timestamping, external deal aggregation. Customer segmentation, pre-quote and pre-deal limit checks, order management workflow, costs and charges recorded, execution rate validation. Continuous price streaming, waivers and other exclusion defaults, real-time quote and deal publication, Systematic Internalisation (SI) status checks, connectivity to all major APA’s. Full automation, cross-asset class, trade data enrichment, reporting rules engine, connectivity to all major ARM’s. Voice recordings automatically integrated with best execution records, All emails between customers and dealers included within trade audits, API integration to major voice and email systems. Internal and external TCA, execution quality analysis, dynamic dashboards, real-time and UTC timestamps. To face the challenges brought about by ever-changing regulations, siena enables banks to meet critical SLAs regarding data reporting deadlines. siena covers the order and trade lifecycle, including everything from an initial conversation and order capture right through to exercise, execution and settlement of the trade. Pre and post-trade reports can be submitted automatically, or retrieved instantly at the click of a button.